Artificial Intelligence is an indispensable part of the framework of modern society - and most apparent in business community, affecting companies both large and small. It isn't just the largest conglomerates who have embraced AI as an all-encompassing platform for infrastructure, communications, operations and management. Smaller operators and consumers have also adopted AI into their daily activity and processes, without realizing the full extent. Most consumers welcome the convenience and enhancements that AI provides. From suggesting songs for your playlist to propagating your newsfeed with stories you find insightful to brand placement and promotions on your search journey, AI stems from age-old concepts of customer service and satisfaction. However in some sectors, Artificial Intelligence represents a major threat to the working populous - will machines ultimately replace humans? We now see AI infiltration across diverse industries as the 'norm', such as transport (think self-driven taxis), financial reporting, construction, farming, medical/health, accounting and banking. There is an argument that humans will simply adapt to the changing future landscape - investing in skills and/or businesses that integrate AI further or work on 'relationship' enhancing services that AI will never replace. Whatever the case, businesses are welcoming AI to improve overall productivity and this alone represents an opportunity for Startups. Innovation and technology is proactively embraced in this region. As a hub for innovation in the Middle East, where does the UAE stand on AI? According to Khaleej Times, AI in the UAE is expected to contribute almost 14 per cent of GDP in 2030, which is equivalent to $96 billion (Dh353 billion) as the global economy stands to claim a contribution of $15.7 trillion (Dh57.8 trillion). AI is at the forefront of the UAE’s governments strategic plans leading to an expected annual contribution of 33.5 percent as of 2018 up until 2030. The government has also formed a Council for Artificial Intelligence to help the UAE develop the AI technology and use it in several governmental sectors. How does AI help startups? The rise of AI has opened bigger, more lucrative doors and contracts on a grand scale for innovative entrepreneurs. Some startups whose core offering is innovative AI technology specifically pinpoint and improve the services offered by other much larger companies. Identifying a need that cannot be necessarily fixed internally. By the same token, many successful AI business stories are focussed simply on consumer satisfaction and solving obvious pain points. As the UAE has a vision to be amongst the most innovative nations in the world, the UAE government is providing individuals and businesses open access to an innovation-enabling environment. This includes providing a regulatory framework and laws that support and foster innovation as well as securing a cost-effective technology infrastructure. Ekar, one of our valued clients, is one of the leaders in innovation in the country. It is dynamic startup and the first car share operator to market in the GCC. It provides a cost-effective alternative to daily and monthly rentals by offering a “pay-by-the-use” pricing scheme. Ekar utilizes innovative technology and industry know-how to provide efficient and cost effective solutions. It is an easy-to-use car sharing platform that allows users to easily book cars across the city through the users' laptop or smartphones. Another CREATIVE ZONE startup client that utilises AI is Leap. Leap is an innovative career platform with inbuilt cutting-edge Artificial Intelligence (AI). It is a platform created to make the lives of hiring managers and recruiters a whole lot easier. It helps match employers with candidates suited to their roles and their company culture and vice versa. Do you have an idea for a successful AI technology? One of the many options the UAE gives its creative entrepreneurs is Free Zone business setup. And what is the ideal Free Zone for an innovative startup? Dubai World Trade Center Authority. As we mentioned in a previous blog, starting your business at the DWTC Authority has numerous benefits. 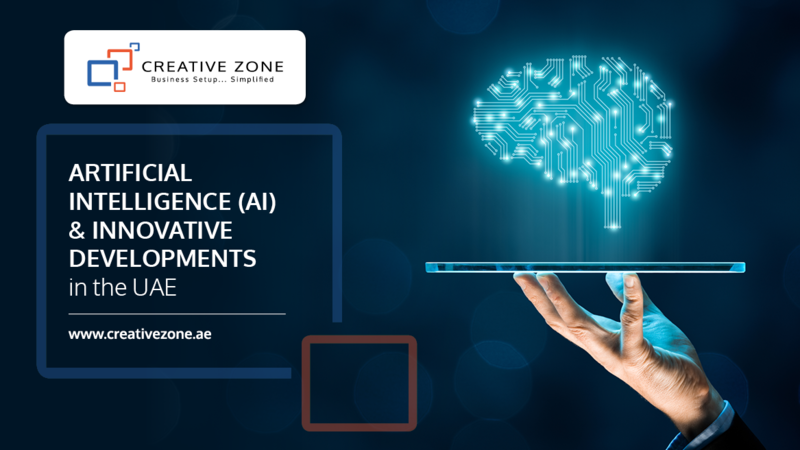 However, with regards to AI technologies and innovative businesses, DWTC Authority is the ideal choice due to the exposure your business idea can gain. As the Free Zone is a host to the biggest events in the UAE, and since AI and the Fourth Industrial Revolution is an active topic in the region, the DWTC Authority is the ideal place for you to showcase your business. When you register your company with the DTWC Authority, you are guaranteeing your business the most of the benefits foreign investors can get when starting their business in the UAE. This is due to the fact that you can still have access to conduct your business across UAE Mainland when you are granted a Business Operating Permit from the Free Zone. Turn your innovative idea into a reality when you start your business at the DWTC Authority. Contact CREATIVE ZONE to learn more about setting up your business at the Dubai World Trade Center Authority.